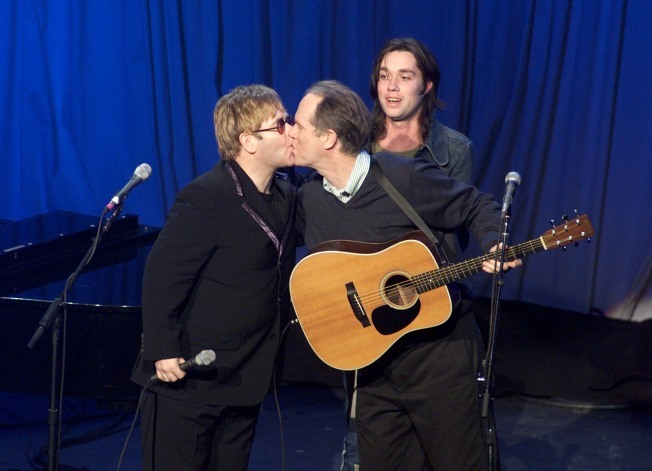 Elton John gives a kiss to Loudon Wainwright lll as Rufus Wainwright looks on. The Wainwright family reunion tour rolls on. Tonight Loudon Wainwright IIIcomes to the Highline playing songs from his recent "High Wide and Handsome, The Charlie Pool Project," and he's bringing the young 'uns with him. Firstborn and star child Rufus will be on hand, together with siren sister Martha. They'll be joined by a mess of the Roches, and younger sister Lucy Wainwright Roche will unite them all. The Wainwrights brought this same shaking-the-family-act to Hamptons a few weeks ago, when they played Robert Wilson's Watermill center on the hurricane-blown weekend before Labor Day. Now New Yorkers have their chance to see this nearly full assemblage of the clan (sadly no McGarrigles, but maybe they'll all get together for Christmas). Perhaps Rufus was worn down from being an opera diva, or Martha from the vamp-act she put on with her latest album. Or maybe they just think singing the songs of (and inspired by) a legendary country music singer and bootlegger is a fine family activity. Either way, it'll all go on for your enjoyment at Highline Ballroom tonight. And while tickets are sold out (which basically means, no dinner seating), there are still $45 standing room seats if you want to catch up all your Wainwrights and Roches in one place.